Over the last two and a half years, I’ve taken a lot of heat from birthers right here in my own blog comments section, on the radio, and in my e-mail box for warning about the lurch into fringe conspiracism — a penchant shared by Trig Truthers, 9/11 Truthers, and birthers. The plain truth will never mollify a Truther. There’s always a convoluted excuse – some inconsequential discrepancy to seize on, some photographic “evidence” to magnify into a blur of meaningless pixels – that will rationalize irrationality. Palin could produce Trig’s umbilical cord and it still wouldn’t be enough. Alas, Trutherism thrives on both the left and right. Which brings us to the spate of lawsuits challenging President-elect Barack Obama’s U.S. citizenship. On Friday, the U.S. Supreme Court considers one of those suits filed by New Jersey citizen Leo Donofrio, who maintains that Obama is not a “natural born citizen” because his father held British citizenship. There may be a seed of a legitimate constitutional issue to explore here (how is the citizenship requirement enforced for presidential candidates, anyway?) And at least Donofrio concedes that Obama was born in Hawaii. But a dangerously large segment of the birth certificate hunters have lurched into rabid Truther territory. The most prominent crusader against Obama’s American citizenship claim, lawyer Philip Berg (who, not coincidentally, is also a prominent 9/11 Truther), disputes that Obama was born in Hawaii and claims that Obama’s paternal grandmother told him she saw Obama born in Kenya. Berg and his supporters further assert that the “Certification of Live Birth” produced by Obama was altered or forged. They claim that the contemporaneous birth announcement in a Hawaii newspaper of Obama’s birth is insufficient evidence that he was born there. (Did a fortune-teller place it in the paper knowing he would run for president?). And they accuse anyone who disagrees with them of being part and parcel of the grand plan to install Emperor Obama and usurp the rule of law. I believe Trig was born to Sarah Palin. 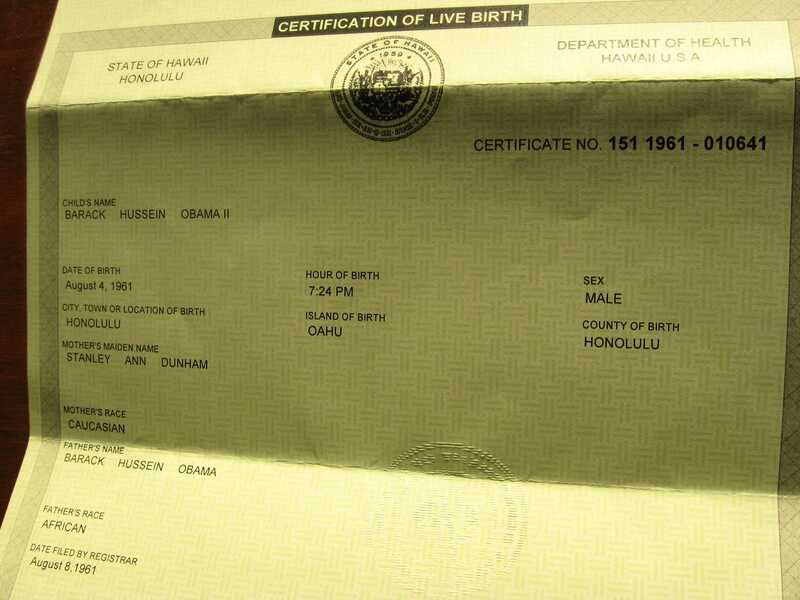 I believe Barack Obama was born in Hawaii on U.S. soil. I believe fire can melt steel and that bin Laden’s jihadi crew – not Bush and Cheney – perpetrated mass murder on 9/11. What kind of kooky conspiracist does that make me? Today, President Obama finally released his long-form birth certificate, carped about carnival barkers, and wagged his perpetually waggy finger at the media for failing to focus on “serious” issues — after which he quickly departed to Chicago for a serious visit with Oprah and more serious campaign money-grubbing events. But while Obama complains about “distractions,” his media water-carriers have served him well by falsely and opportunistically casting every conservative activist as a fringe birther conspiracist — and by boosting celebrity big-government fraud Donald Trump at the expense of bona fide conservative candidates/issues. Much hay will be made about the timing of the release, the authenticity of the document, who gets the “credit” for forcing Obama’s hand, etc., etc. etc., blah, blah, blah. As I’ve said consistently throughout the entire birther circus, I have chosen to fight other grass-roots conservative/limited government/anti-corruption battles. And that is what I’ll continue to do here. Truthers of all stripes, feel free to wallow in the fever swamps. The rest of us have work to do — and Obama’s messes to undo.